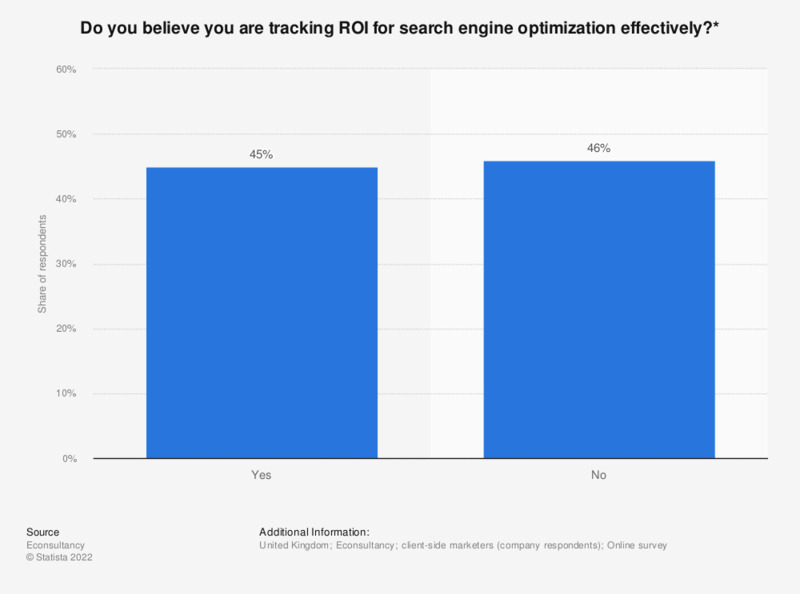 This statistic displays the results of a survey of company marketers (client-side) regarding the effectiveness of their SEO ROI tracking in the United Kingdom in 2013. According to the source, Econsultancy, the results were split with 45 percent responding 'yes' and 46 percent responding 'no'. * The source does not provide information regarding the question. The chosen wording here might therefore differ slightly from the survey. ** The source reports that survey respondents included 482 client-side marketers (company respondents) and 288 supply side respondents from agencies and consultancies. The respondents to this particular survey question were only client-side marketers (company respondents). Otherwise, the source did not specify the exact count of respondents to this particular survey question. The source does not provide information about the share of respondents missing to 100 percent.